Our aim is to offer a variety of healthy choices at a reasonable cost. In addition to the menu we endeavour to have new items daily on a blackboard outside the canteen. We encourage pre-ordering of lunch, as to not be disappointed when the queue is long and demand exceeds supply. 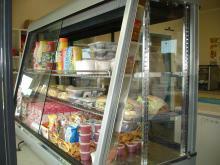 The Canteen operates a prepayment system. This facility may be set up completing a Canteen Card application form and an initial payment to the College office. Once a credit balance has been established the student will be issued with an account card that must be presented when ordering/purchasing their lunch. At each transaction a printout from the till will show the remaining credit balance of the account. Top-up of this balance may be made by payment directly over the Canteen counter, by either Cash, Cheque or Eftpos. NB: Any existing automatic payments to the College for family accounts will NOT be transferred to the Canteen. IMPORTANT – If there is NOT a credit balance on the account, the student will not be allowed to purchase against it. Please click here for the Spring 2018 menu. Please note that prices are subject to change.